2 POWER MODES - Dual power functions which are by AAA Batteries (Not Included) or by USB power source when plugged in, provides you with more optional and convenient power choices. 7 COLORS LED LIGHTS - There are 7 different colors available to create a comfortable atmosphere to your preference. By selecting the colors between bright and dim modes, enjoy your whole lovely day. COMPACT AND PORTABLE DESIGN - With light-weighted and compact design, perfect to be portable anywhere you want. 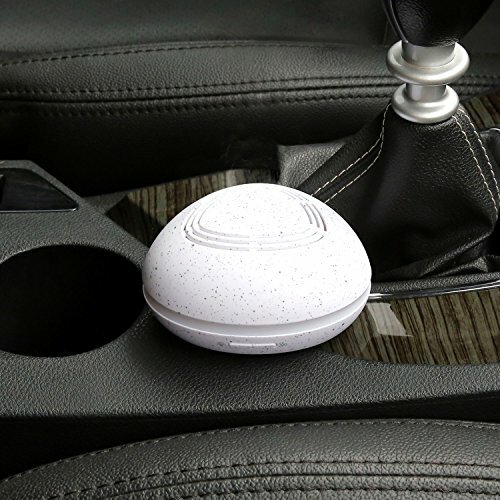 A good aroma diffuser companion in your life which can be placed in your car, bedroom, yoga room or office. EASY TO USE - Just by adding your favorite essential oil on the fiber pad (3 pieces included), then press the button to enable the fan inside working. Just the right size for the car.